A LED processor usually takes a single video input (DVI/HDMI/VGA/composite) and divides this signal over the connected LED walls. The processor will only take the top left part from a regular video signal. In this case the regular video signal is 1024x768, but it could be any standard video resolution. It's only interested in the 384x192 pixels in the top left of that signal. The rest it throws away. 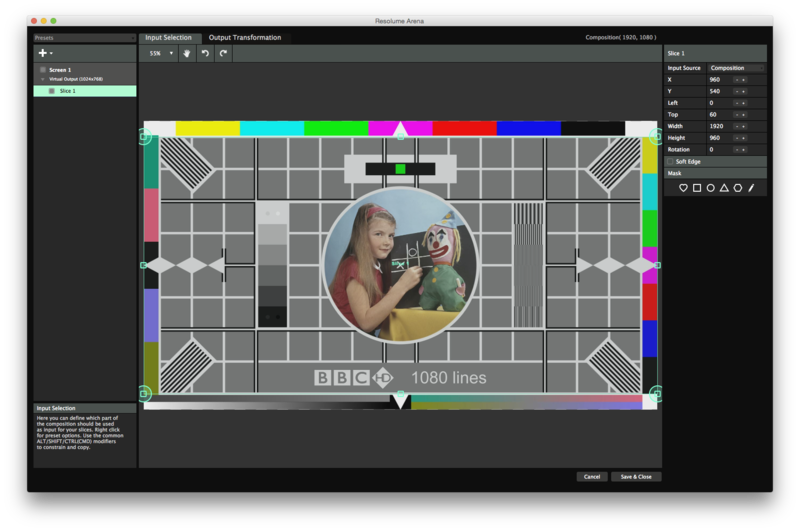 You could of course render all your content to this scale before show, but it's much easier to use the Advanced Output. Create a new setup, and on the Output Transformation stage, you make your single slice 384x192 pixels in size and place it exactly in the top left of your output. Now switch over to the Input Selection stage, right click the Slice, and hit Match Output Shape. This will place your slice exactly in the same place as it has on the Output Transformation stage. Drag it back to the center, letting the snapping do the hard work for you. Now scale it up until it fills the entire Input Selection stage again, Make sure you hold down both Shift and Alt to scale proportionally from the center! 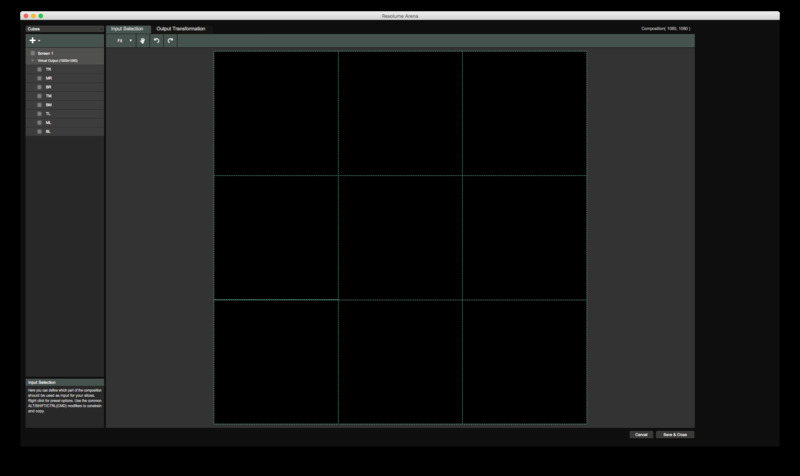 What you have now is a slice that takes a 2x1 piece of your composition and places it in the top left of your output. This means that you will exactly see that part on your LED wall. By first matching the output shape, you've made sure your input slice has the same aspect ratio as your output shape. This means you probably lose a bit of the top and bottom of your composition, but your circles will still look like circles and not squished eggs. The annoying thing is that the 4 screens are positioned like that on the stage, but not in the LED processor. In the LED processor, they might be arranged something like the image below. This is done to minimize the data sent along the cable connecting the LED screens. We've included a Photoshop mockup in the bottom right to help you get the idea of how the processor relates to the stage. Tip! Keep in mind that 4 screens like this are still controlled by a single LED processor. So you only have to send out one signal from your computer's output. The processor divides it over the 4 screens. Only on very complex, high resolution LED stages will you need to use 2 or more processors and thus 2 or more outputs. 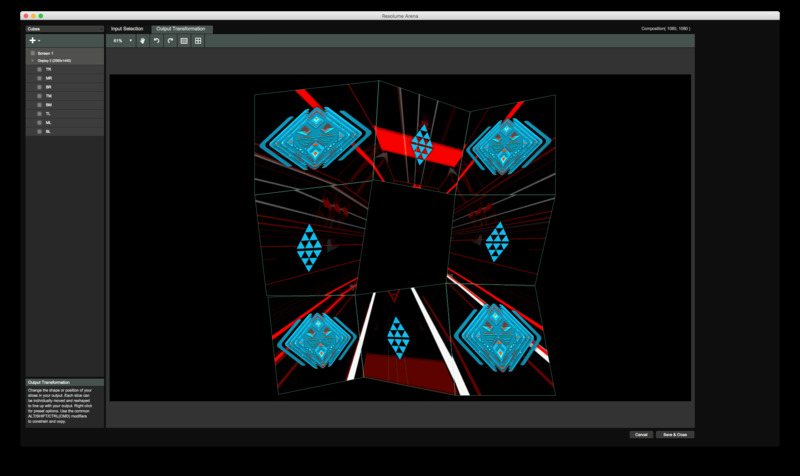 Just like with the single LED screen, first you recreate these slices in the Output Transformation tab of Resolume's Advanced Output. This way you send the processor the signal that it wants to see. If you're working with a LED supplier who knows what they're doing, they can give you this 'output mapping' before show. All you need to do is fill out the numbers that they provide and name the slices to keep things organized. Then, on the input, lasso all four slices to select all of them. Then right click and choose Match Output Shape. This will pop the 4 slices into the exact same position and scale they have on the output stage. Place the 'Center' slice exactly in the center of your comp. Place the other slices around it like they are on the actual stage. Unless you want to break out the tape measure, this usually takes some guesstimating and eyeballing. In the end it's about selling the illusion to the crowd, so it doesn't matter if you're a few pixels off. Tip! Depending on the stage, there's always a certain trade-off between correctness and pixel count. 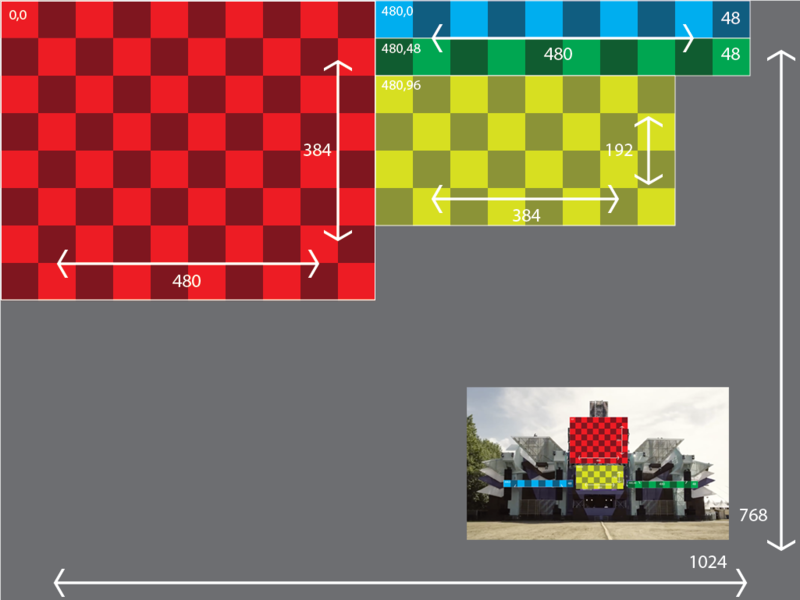 When you're dealing with a few low pixel pitch LEDs combined with a lot of big crude lowres screens, a perspective correct input map could require your comp to run at 4K or above, In those cases, it might be a good idea to sacrifice a bit of correctness for the sake of still having a decent frame rate. 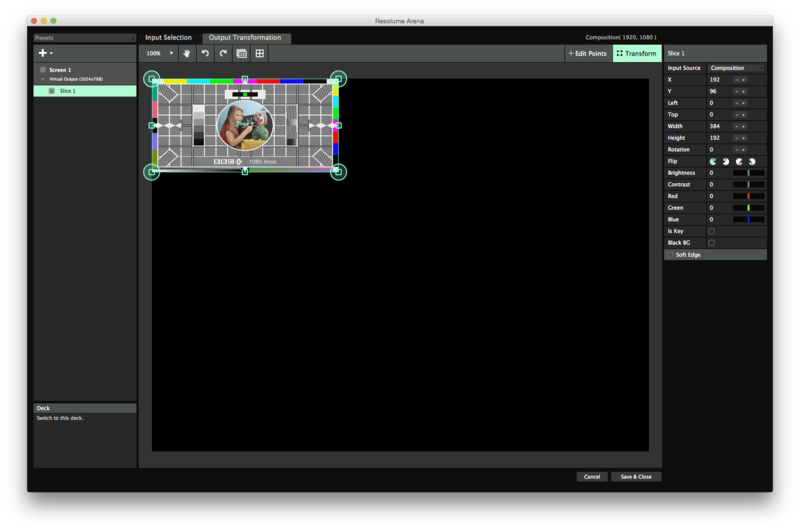 Once you're satisfied with the layout, lasso all the slices and scale everything up till it fills the canvas again. Shift and Alt are your friends here! Now whatever you play in your composition will translate perfectly to your LED wall. If you want a DJ's name to only appear on the center wall, all you need is scale it down using the clip properties till it fits. Or even better, you can use the Slice Transform effect to place content directly in every slice you want. Tip! If you're working with LED walls with mixed pixel pitch, you can scale the lower res tiles up more on the Input Selection stage. This will keep their output resolution the same, while taking a larger area of pixels as input. This way, the overall image on the stage will still look perspectively correct. 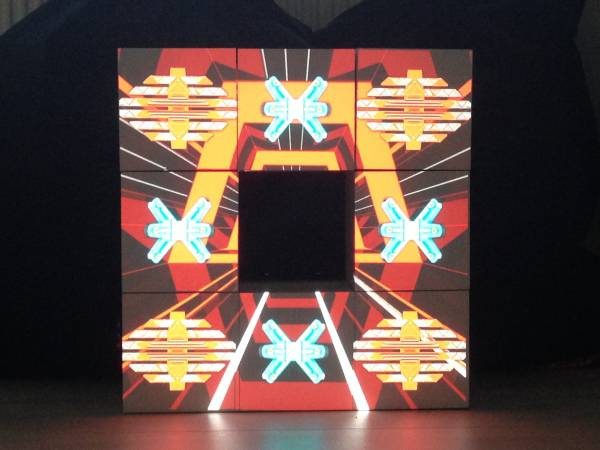 As far as the output is concerned, projection mapping is usually a lot more guesstimating and eyeballing than working with LED screens. Even then, having a good input map is a great time saver. Let's take the following example of a structure consisting of 8 cubes. Even though you might not know the exact alignment of the objects on the night itself, you know it's going to be positioned like this. You can already start working on this before you even arrive at the venue. 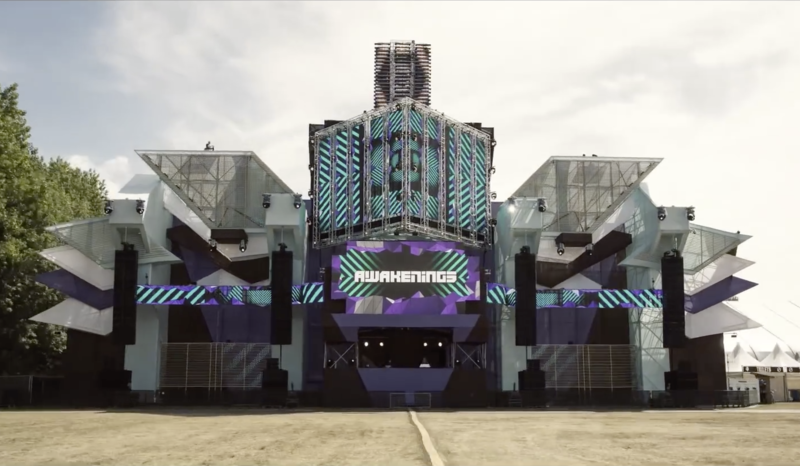 To have some creative options on this stage design, you might want to play some content over the entire structure, and other content only in a single cube or in a combination of cubes,. We'll use an input map to make this a piece of cake. First thing is to create an input map based on this shape. We start by creating the exact same cube shape, in the Advanced Output using slices. First we have to figure out how big to make our composition. 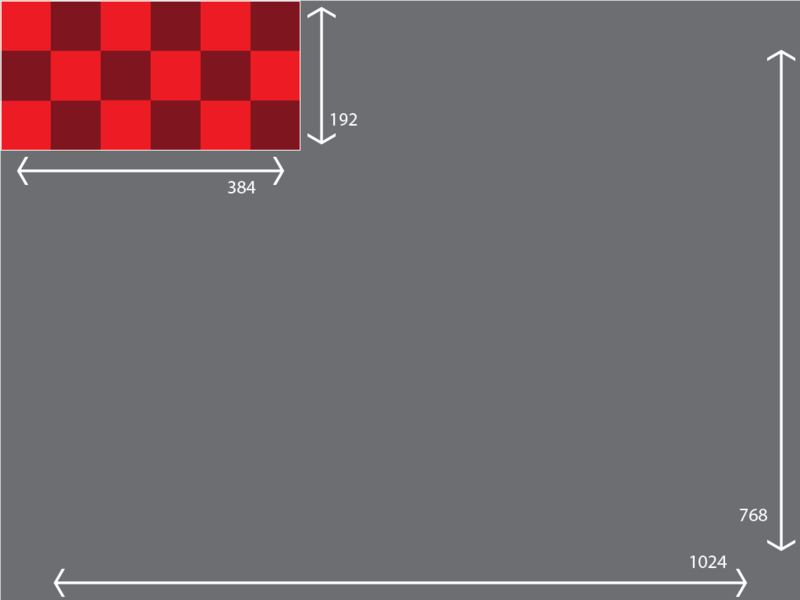 If we take a regular HD signal (1920x1080 pixels) as our starting point, we will need 8 slices of 360x360 pixels. We know this, because the object is 3 cubes high and 1080 / 3 = 360. 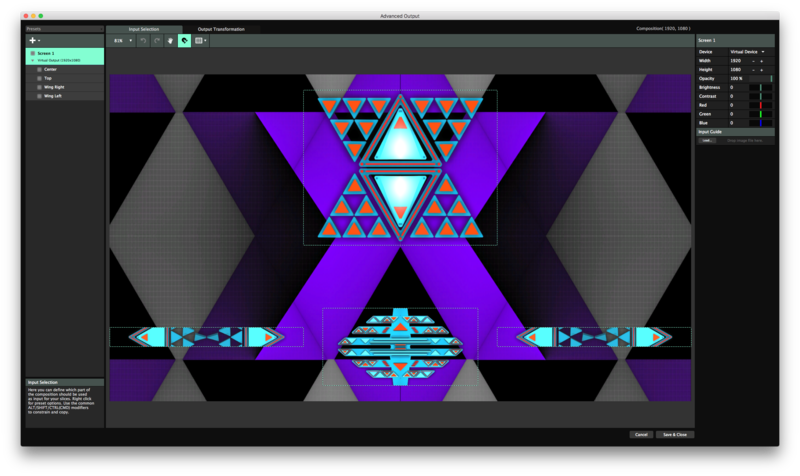 This means that our Resolume composition will be 1080x1080, because cubes are always square. So set the composition size to 1080x1080. Open the Advanced Output and make sure you are working on the Input Selection stage. Let me repeat this, because I don't think you heard me. Make sure you are working on the Input Selection stage. We're not interested in the Output Transformation at this point, only in choosing which parts of our composition to use. After you've created the first slice, place it exactly in the bottom center of the Input Selection stage. Now create copies and place them around the stage, in the same positions as the actual cubes. This will go really quickly, because you can alt-drag to copy the slice, and then the copy wil snap to the original and the composition edges. Bam. Your input map is done. 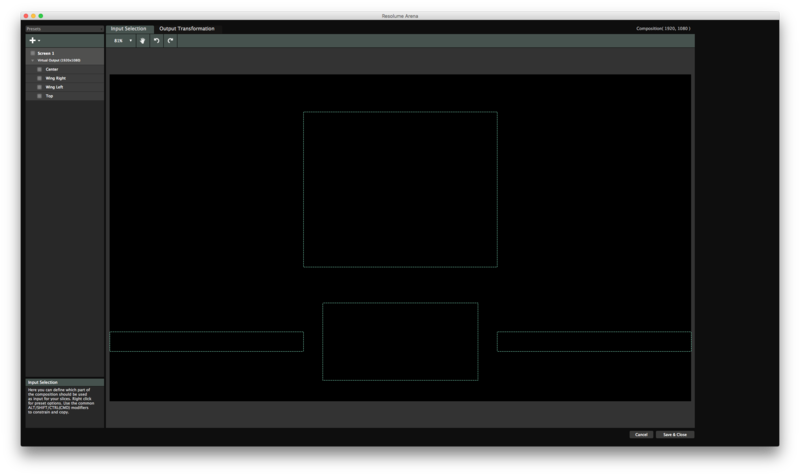 Now in the composition, we'll make our first layer our Fullscreen layer. This is easy, because the input map already takes the correct input from the comp. We'll lose some of our 1920x1080 content on the sides, but we're keeping the aspect ratio intact so our circles stay circles. Layer 2 will be our Everywhere layer. We'll put 8 copies of our content, one copy on each cube. 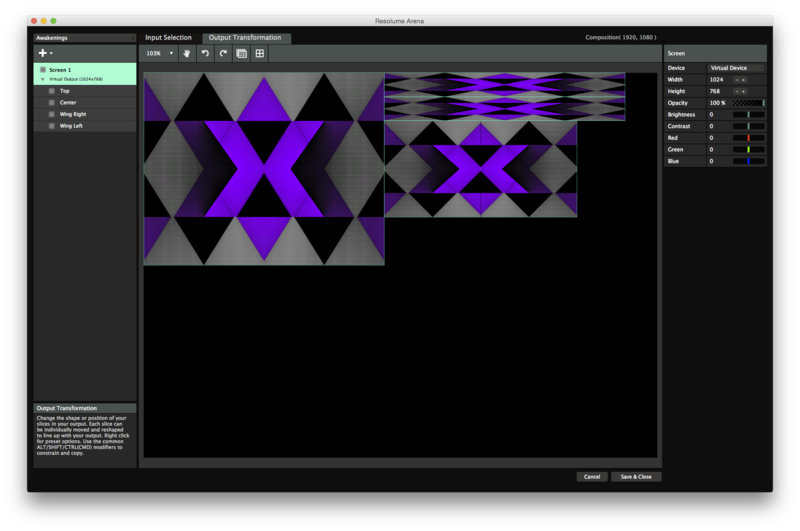 From the Slices tab (View > Show Slices), drag Screen 1 onto Layer 2. Bam. Done. We'll duplicate this layer, and use the Bypass buttons for each slice to create variations. You can create as many duplicate layers as you want content on specific cubes. On the last layer we'll add some animated Lines from the Sources tab. 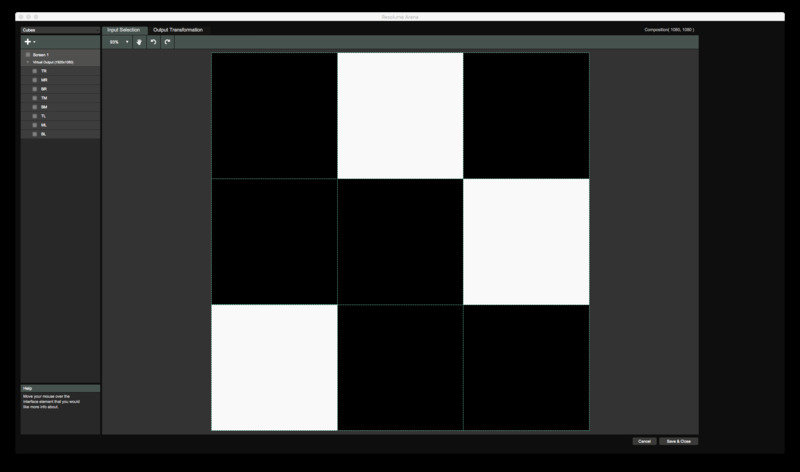 Using the LoRez effect with its Pixelation parameter at almost maximum, we'll have 9 blocks of white turning on and off. We can use this as a mask or as some stroby bump content. When you're at the venue and connected to the projector, go to the Output Transformation stage, lasso all the slices and right click them. Choose Match Input Shape and all the slices will pop to the place they have on the input stage. Now move and scale the cube grid roughly into position. Where necessary, drag the individual corner points to align exactly with projection. 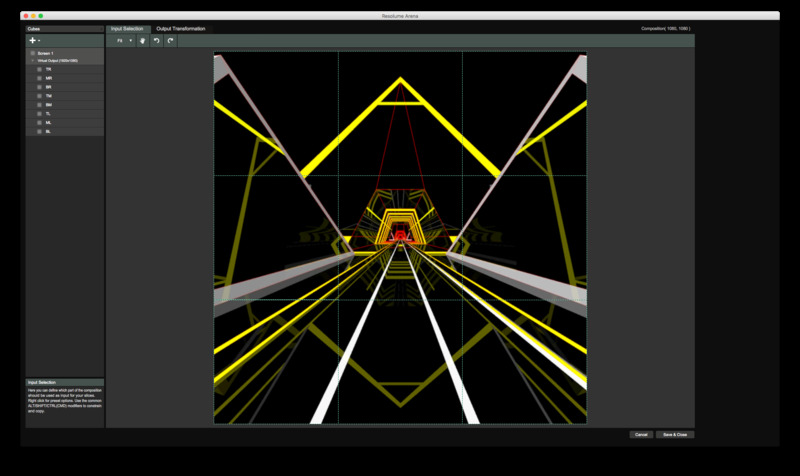 After a little work, the projected input map should line up exactly with the actual object. 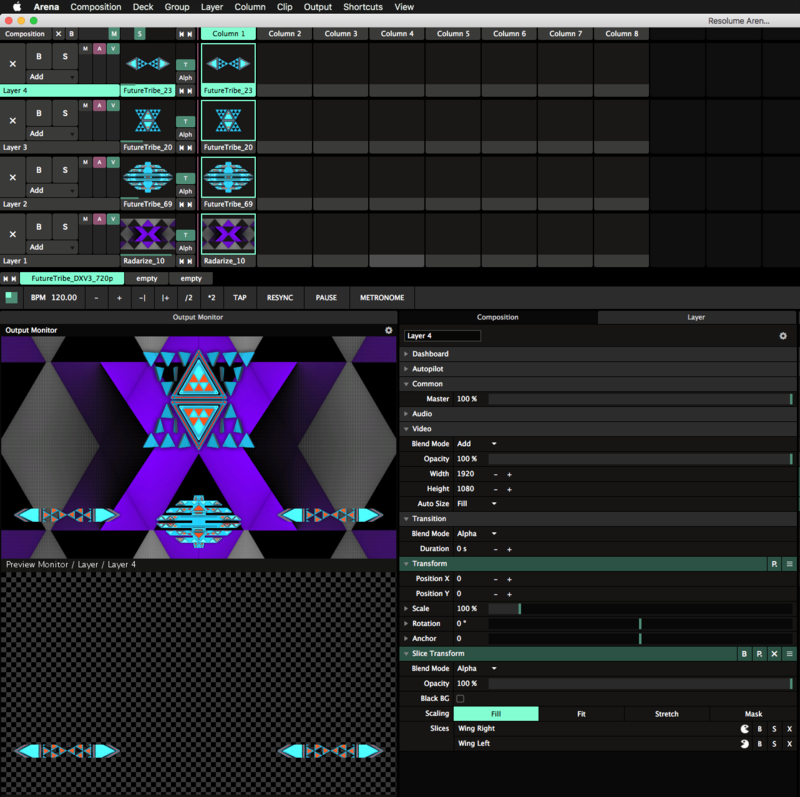 Because you have created an accurate input map, you can easily mix custom content with your regular VJ content. As long as you make the cubes in your content exactly 360x360 and the clip itself exactly 1080x1080, it will line up perfectly with your other content. VJFit has an excellent tutorial on how to make custom content in Cinema 4D for this setup. An added advantage is that, should you do this show in a different location, you can just re-use the same animations and input map. All you need is adjust the output to the new projector location and you're good to go for show! When working with objects that are not geometric, you have to rely on the content to make your input map. 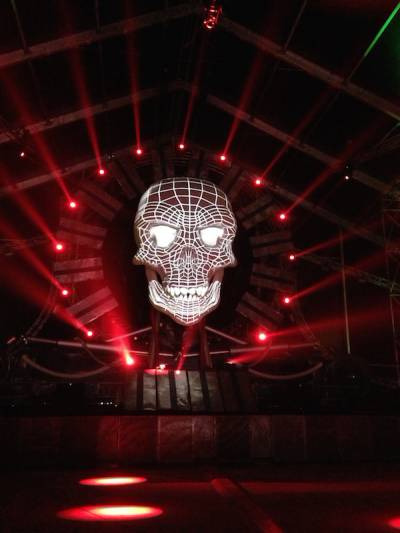 For instance, to map on an inflatable skull like this, you will first have to make the content in Cinema 4D based on the measurements of the actual skull. 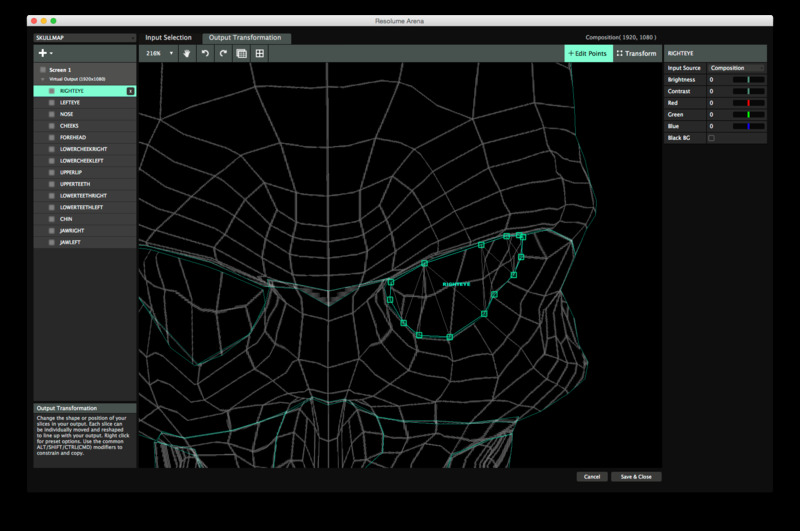 Then you divide the skull into several poly slices, one for each major part of the object. You can go with a slice for the forehead, one for each eye, jaws, nose, left cheek and right cheek, upper teeth, lower teeth and chin. Of course, you can create more or less poly slices, the more or less accurate you want to be. You can go as far as creating a poly slice for each tooth. Then you position and scale each poly slice roughly in the projection and fine tune its points to align perfectly. Tip! On any projection mapping job, take plenty of breaks, bring a thermos of tea and some good music. A masseuse is optional.